After years of dedication to the Toucan, Cap’n Crunch has officially beat out Froot Loops as my favorite sugary cereal, all because of this recipe. While it’s hard to improve on fried steak covered in gravy, the puffed corn cereal does it. The Cap’n’s sweetness is the perfect foil to rich, peppery gravy. 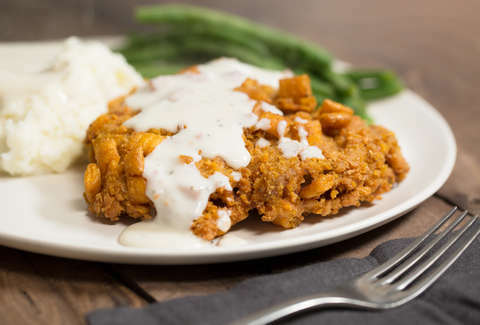 It’s so good that no one should judge you for making chicken-fried steak a part of your very balanced breakfast. Pat steaks dry with paper towels. Place one steak in a resealable plastic bag. Using a meat pounder, rolling pin, or heavy skillet, pound steak to an even 1/4-inch thickness. Repeat with remaining steaks. Season each steak with salt and pepper. Place cornstarch in a shallow dish. Whisk together egg and 2/3 cup buttermilk in a separate shallow dish. Whisk together flour, 2 teaspoons salt, paprika, black pepper, onion powder, garlic powder, baking powder, and cayenne pepper in a third shallow dish. Drizzle remaining 1/3 cup buttermilk into seasoned flour and rub with fingertips until mixture is like wet sand. Place cereal crumbs in a fourth shallow dish. Take 1 steak, coat well in cornstarch and shake off excess. Transfer to egg mixture and let excess drip off. Transfer to flour mixture and coat well. Transfer to cereal and press it in to adhere to the steak. Repeat with remaining steaks. Place oil in a deep fryer or large pot and heat to 375°F over high heat. Gently slide 1 steak into the oil. Cook, flipping once, until golden brown and crisp on both sides, 3-5 minutes total. Transfer steak to a paper towel-lined plate and repeat with remaining steaks. For the gravy: transfer 1/4 cup of the hot frying oil to a medium saucepan placed over medium-high heat. Add flour and whisk constantly until mixture turns light brown, about 1 minute. Slowly whisk in milk. Stir in pepper and bring to a boil. Reduce to a simmer and cook, stirring occasionally, until slightly thickened, about 4 minutes. Remove from heat; season with salt to taste. Transfer steaks to serving dishes, top with gravy, and serve immediately.